I am sending you three "chemtrail" photos taken by my brother yesterday afternoon (February 20th) in Portland, OR. 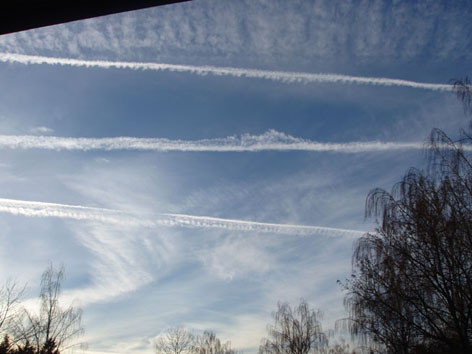 I did not notice chemtrails in the sky yesterday, as I spent almost the entire day indoors, but here's what I DID notice: All day long, I was experiencing a sensation in my chest and lungs, similar to the sensation one gets when recovering from a cold or flu. It was not that I was congested, but rather that I was having to focus conscientiously on BREATHING. This problem was marked enough that I slept very poorly last night, eventually developing a bad headache, and mild rapid heartrate. I did not connect this to any chemtrail activity, as I had not been outside. This morning, I told my dad of this experience, and he said that he has suffered the exact same ailment over the last couple of days. 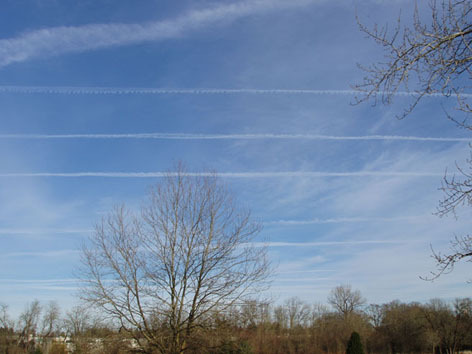 Coincidentally to this, my brother just showed me these "chemtrails" a couple of hours ago that he shot late yesterday afternoon. I would be very curious how many people in the Portland area have experienced the difficulties in breathing and other symptoms that I described? And no, this does not seem to be the common cold or any other common ailment. This is in response to the Portland chemtrails story that was posted yesterday... Feb. 20th was extremely active and there were chemtrails blanketing the sky ALL DAY LONG! ; What is interesting is that I too have had symptoms in my lungs that resemble the last stages of a cold (FYI: the last time I had an actual cold was 4 years ago!). ; Many of my friends have been complaining about insomnia lately, and I have also had insomnia for the first time in many years during the past few days. When will we get to just enjoy the blue sky? 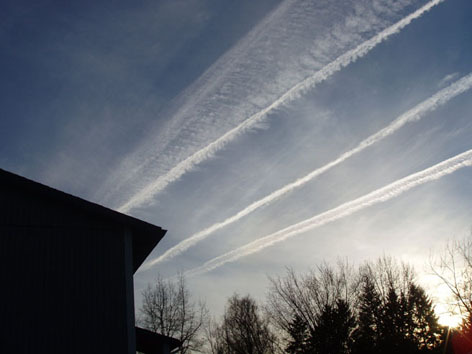 In response to Chemtrails over Portland: This last week thru this weekend saw the heaviest spraying I have witnessed in a while. I wanted to relate a few medical anomalies. Late last week, my 4 yr old daughter came down with coughing so bad that my wife took her to Kaiser. She had no other cold symptoms, she just started coughing in the middle of the night Thursday. The pediatric clinic was overrun by younger than school age kids- all with respiratory distress. While they waited, 2 children were rushed to the main hospital with breathing problems, and numerous appointments were cancelled due to the huge overage of drop in patients. I found this to be noteworthy, since these kids wouldn't normally be exposed to illness in group settings like school, and no school aged kids were present. Meanwhile over the weekend, amidst extremely heavy chem spraying, my entire family came down with cold symptoms, but no colds. My wife and I had insomnia, which rarely happens to both of us at once. Did anyone else notice strange occurrences at medical clinics?